Saint Francis of Assisi is one of the few Western saints from the period after the great schism who is also revered in the Eastern Church. Many Franciscan churches were built in Crete during the Venetian period, including churches in Iraklion, Rethymnon, Chania and Neapolis, and Petros Philargos, a friar of the Franciscan community in Iraklion who was born in Neapolis in eastern Crete, later became Pope Alexander V.
As I strolled through the streets of Rethymnon last night, one of the churches I visited was the Church of Saint Anthony of Padua, on the corner of Mesolongíou Street and Salamínas Street. This church is run by the Franciscan Capuchins and is the only Roman Catholic Church in Rethymnon. After an absence of over two centuries, ‘God’s paupers’ returned to Rethymnon in 1855 when the Franciscan Capuchins built a small monastery on a corner of Mesolongíou Street. There had been a continuous, albeit small, Catholic presence in the town since the arrival of the Venetians in the early 13th century, and by the mid-19th century the local Catholic population in Rethymnon was eager to build a new church. The Roman Catholic Diocese of Crete was established in 1874, and the first bishop was an Italian-born Franciscan Capuchin, Luigi Canavo (1827-1907), who was Bishop of Crete from 1874 to 1889. Catholic numbers in Rethymnon increased with the arrival of Polish soldiers among the allied forces sent to Crete in the 1890s to hold the peace between the Ottoman Turks and Greek islanders demanding union with the modern Greek state. 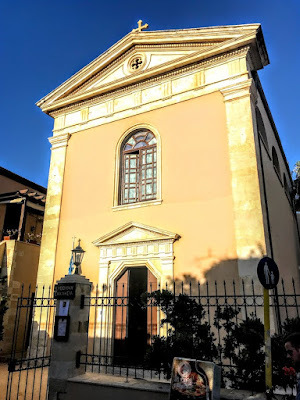 A small neoclassical church was built on the corner of Mesolongíou Street and Salamínas Street, behind the old port and close to the entrance to Fortezza. The new tall, slender, Church of Saint Anthony of Padua was completed on 30 March 1897. The doorway is crowned by a pediment with a semi-circular Venetian window. Above this, there is a circular window in an opening in the centre of the tympanum. After World War II, Saint Anthony’s church was sealed for many years, and was in a hazardous state of repair. It was renovated in 1982-1988 and restored to its former glory 30 years ago with the help of local people and foreign residents, mainly from Switzerland. 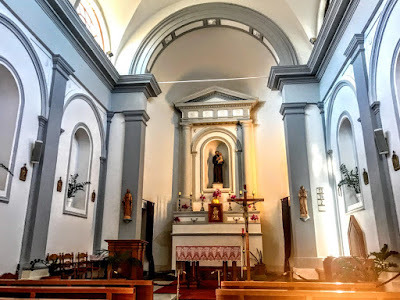 There is an older church in the basement beside the present neoclassical church. This was used by the Capuchin Friars from about 1855 and is still in good condition. It is now used as a garage, but it served as a church once again briefly in the 1980s while the main church was being refurbished. The determination and passion behind the renovation and restoration of Saint Anthony’s Church was the work of a priest of the Catholic Diocese of Crete, Father Andreas Marzohl from Lucern in Switzerland. Today, the majority of visitors to the church are the thousands of tourists who visit Rethymnon between March and November. The church is open all day, every day, for visitors the church. Saint Anthony’s Church is the town’s only Roman Catholic Church but it continues the traditional Franciscan link with Rethymnon. In the Venetian era, the most important church in the town was Saint Francis (Aghios Frangiskos), the church of the Franciscan Friary in the town. This church, which stands on Ethnikis Atistaseos Street, is one of the most important examples in Crete of western European architecture, with its doorway, interiors, carvings and proportions. The elaborately – almost excessively – decorated ornate doorway is mainly Corinthian in style but includes the only example in Rethymnon of compound capitals. Saint Francis church was used as an imaret or poorhouse during the Turkish period. In the 1920s, it was used to shelter Greek refugees from Anatolia. In more recent years, it contained a number of shops, and then until 1996 it was used as an exhibition centre for the local city council. Careless and fruitless attempts at restoration work in the 1970s led to part of the building being demolished. However, recent excavations around the church unearthed some important archaeological discoveries, including the tombs of two Venetian nobles. For a time, the building belonged to the University of Crete. Later there were plans to use the former church to house the Byzantine Museum of Rethymnon and the Byzantine and Post-Byzantine Collection of the Prefecture of Rethymnon. Today it houses the Archaeological Museum of Rethymnon. Services are held in Saint Anthony’s Church from April to October on Saturday (7 p.m.) and Sunday (10 a.m.) and from November to March on Saturday (6 p.m.).